Bought this for my daughters room. Very happy with the quality and fill. Not too heavy but kept her warm enough through the winter months. Is made from the finest hypoallergenic materials, designed to give any room a greater sense of luxurious style and fashion. 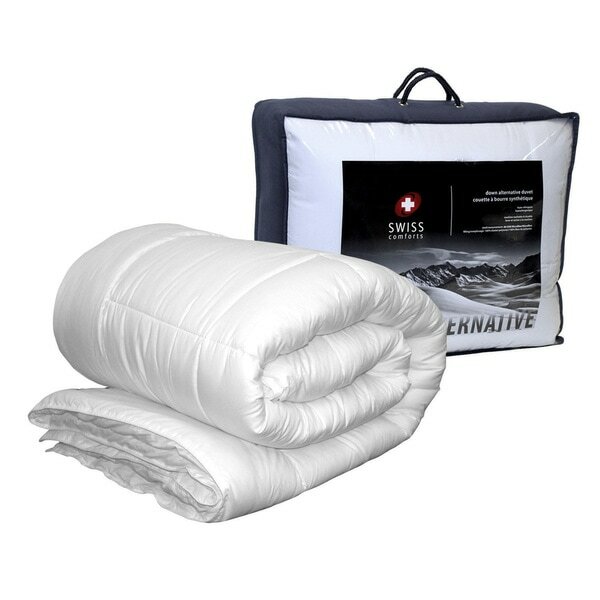 Swiss Comforts’ legendary commitment to comfort and quality gives this item enduring value. Enjoy the warmth and comfort of a down comforter and rest easy. Is a versatile addition to any bedroom. With double piping all around the Duvet, This Brushed microfiber fabric is machine washable for easy home care, and its Filled with the luxurious synthetic down that emulates the finest fill of goose down. The gel coated polyester fill gives the comforter the same slippery and pliable lightweight feel as a down duvet but is hypoallergenic. ⦁ Overall Product Weight: 5.18 lb. ⦁ Overall Product Weight: 6.92 lb. ⦁ Overall Product Weight: 7.64 lb. Extremely well worth the price. Feels wonderful and soothing to the touch. The piping is a great touch, Once the comforter is out of the bag and fluffed, it is delightful. I will be replacing all my bedding blankets with down comforters. The material is so soft and the comforter is very well made. I love how soft and warm this comforter is. It fit our king bed perfect! Money well spent. Even and full of down filler across the entire comforter. Just as advertised thickness. This is perfect for a kids room or guest room, very comfy! I bought the king for my queen size bed and it works out perfect. It doesn't seperate after washing. "Does this comforter have loop or ties for a duvet cover?" Hello ELAINE A K., King Size Overall: 88" L x 68" W Overall Product Weight: 6.25lbs. Have a great day!